I have been working with Louk for only two weeks now. I am amazed of the results in such a short period of time --- weight loss and body reshaping. He took the time to analyze my body type, assess my goals and create a program that will work for me. I am 56 years old and I need to lose 40-50 pounds. Before I met Louk, I had no idea how I would do it. With Louk, I am confident I will be able to do it, probably in less time than I expected, with not only a sound nutrition plan but also good training habits. If you are looking for the best trainer around, I recommend Louk. Stephen E. McKenzie – President and CEO, Larson-Juhl Inc.
After working with Louk for only two months, the loss of 33 pounds and all the inches off my neck, waist, chest, and legs has been transformation. I feel younger and have more energy than I had in the last 15 years. Your belief in me and my ability is another big factor in the transformation. Thank you for all you’ve done and I look forward to continuing on this path together. Louk started me with a metabolism boost to my diet, designed the right food plan, and continues to be motivational force for me. I’m amazed at my increased strength and overall fitness and health results. I’m back to the size I was in high school! But most importantly, I have never felt more committed to maintaining myself and feel great everyday. Louk, thanks for brining out the best! After spending my 30s getting heavier and heavier, and rationalizing that I didn't have time to exercise because of my busy family and work life, I finally realized that I was looking and feeling older and weaker than I needed to. I tend to be pretty disciplined overall, but like most people I needed a few things to get started: the knowledge about how to eat better, my wife's encouragement, and someone to oversee an exercise routine. In just 30 days I lost 30 pounds and reduced my cholesterol to 126, my pulse rate to 48, my blood pressure to 100 over 70, and my body fat from 34% to 18% and I can already tell a difference in my strength and energy levels during the day. Louk, thanks very much for helping me kick-start my new fitness program. Jeff Warren – ProfiTel Group, LLC. "I’ve worked with Louk now for four months. He’s been a great teacher, trainer, motivator and friend. Not only has he taught me numerous exercises for each area of the body, which keeps our sessions fresh, but he has also taught me the importance of proper form, posture, balance, and the value of healthy nutrition. In four short months I’ve lost 22 lbs. I’m stronger, leaner and have better tone now than when I was 20 years old. " "I have asthma; it’s something I’ve struggled with my whole life. Growing up, I avoided anything physical. Hiring a personal trainer was the last thing I ever thought I would do. Meeting Louk changed that. Louk worked patiently with me, focusing on my cardiorespiratory fitness. He personalized a plan to accommodate my needs. He not only focused on the physical aspects, but concentrated on my well being as a whole. What separates Louk from the rest is that he genuinely cares for his clients. Working out was something that I dreaded, now it’s something I can’t wait to wake up in the morning to do. " 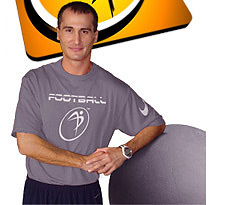 "Damianov taught me the program but, more importantly, he taught me the profound truth about having a strong core. I've lost almost 10 pounds on an already lean frame, but I've built strength and improved my physical posture. At 41 years old, I feel much healthier than any time in my life." "I have lost 75 pounds and more than 30 inches since October with a combination of changes in eating habits and exercise. I have never been a person who liked to work out, but Damianov has helped me firm up, gain strength, and most of all, gain confidence in my ability to control my weight and remain healthy." Dr. Jason A. Weniger, D.C.
Louk, your methods have proven to be true and very effective. Since beginning the programs that you tailored specifically for me and my needs I am happy to report that I have gone from a sluggish and fatigued – 198 lbs doctor to a happy, healthy, energetic 170 lbs doctor who now has the energy to make it through his day without the need for caffeine all the time or nap in the middle of the day. I truly thank you for all you did in helping me change my life not just for now but for the rest of my life. "He is VERY patient with me, making sure I learn the exercise correctly to provide maximal benefit, but in a fun and relaxed manner. And, he is always complimentary - noticing even the smallest improvements, which really helps to motivate me. He is very knowledgeable, reliable, motivating - and a lot of FUN to work with. His personal training skills are superb and this has been a wonderful experience for me." "Damianov understands the needs of his clients and helps his clients achieve their goals and objectives. I can honestly say that if wasn't for Damianov, I would not be getting up at 6:30 in the morning to work out at least three times per week." "As fitness professional Damianov has been extremely motivating and supportive. Damianov is someone that is easy for me to work with, even through the hard times. He is a man who practices what he preaches, and truly cares about what he does. I am lucky to have the opportunity to be a client of his. "Damianov leads by example. He is in amazingly great shape. He demonstrates a clear understanding of exercise physiology, and the value of graded exercise routines. He is a great motivator and helps me remain focused and committed to my goals of personal health." "Somehow you have obtained the keys to unlocking a person's trigger points for diet, exercise and optimal health. You observe a client's needs from the holistic perspective. Every person is an individual puzzle to which you connect the dots that ensure success." "Damianov's training concentrates on my total health -- including cardiovascular training, weight training, and my eating, sleep and work habits I saw more progress in the first two weeks with him than in any given month of working out during the past." "Damianov has helped me put together a weight-training program, which is fun and goal-oriented. He encourages me and is very particular about doing the exercises properly I am stronger, feel better, and look better. I have a more positive attitude and feel more confident." "I set up a series of training classes, and since I have been seeing Damianov, I have noticed a tremendous difference in my rotator cuff, which has been an ongoing problem for many years." George W. Daneker, Jr., M.D. "Over our time together I have achieved not only my goal but also derived benefits that I did not imagine. Your approach to fitness is an excellent example to follow. Your gentle but firm "no-nonsense" interaction is what I needed. You are always upbeat, positive, and turn exercise into an "uplifting" experience. In addition, you have been always punctual, reliable, and professional." William A. Matteson, President – An Executive Search Corporation Inc.
"Damianov is outstanding fitness professional and genuinely friendly, well organized and highly competent. Thank you for all you do. "Damianov, I wanted to let you know how much I appreciate your efforts as my Personal Trainer and how pleased I am at the progress I have made during this short period. I am convinced that I would not have been able to accomplish this progress without your help and motivation. Thank you and keep up the great work." "Damianov has a knack of bringing out the best in people, whether they are his co-workers or clients. He is consistently positive in his approach to people, resulting in a happier, more motivated client. I found his clients showed quick physical results in their training results, which also paid off, in their improved attitude and quality of life." "Since I am an avid golfer, I hoped one of the byproducts of a fitness routine would be an improvement in my game. This has happened and I could not be more pleased with both the increased fitness and improvement in my game." Taco Proper, President – The Travelers Site Inc.
"Damianov strives in his programs and ideas to achieve benchmarks in the programs he puts together, so we as customers can see results in the shortest possible time. He gets the greatest satisfaction when his customers see changes in their bodies in a rapid fashion."